licking the air for prey. having no time to talk. 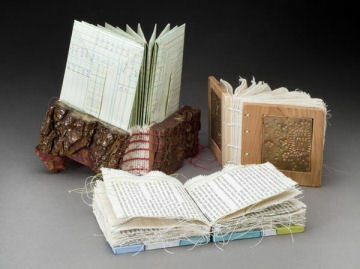 Erin Sweeney is an artist whose current work combines fibers, text, and the book form. She completed her MFA in Book Arts and Printmaking at the University of the Arts in Pennsylvania, and holds a BFA in sculpture from the Maine College of Art in Maine. She shows her work nationally, most recently at Anderson Creative in Canton, Ohio. Erin is also an instructor, teaching book arts workshops at her Lovely In The Home Press, in Peterborough, New Hampshire.